The father of a marine who was killed in action visits his old military buddies and asks them to join him at his son's funeral at Arlington National Cemetery. One of the hardest things a person may ever have to face is the loss of a child. It is something no parent expects to do. When your kid is off fighting in a war, it's something that becomes increasingly more likely. 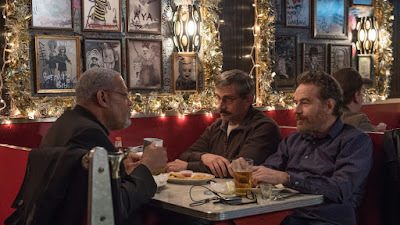 Dealing with such a moment is the focus of Richard Linklater's film "Last Flag Flying," which has been adapted from a novel of the same name by Darryl Ponicsan. The movie stars Steve Carrell as Lary 'Doc' Shepard, a former Navy man who has just received word that his son, who was serving as a Marine in Iraq, was killed in action. Doc seeks out a couple of former military buddies who served in the Marine Corp with him. 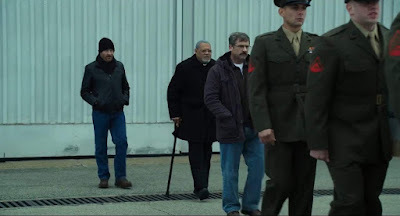 The first man is Sal Nealon (Bryan Cranston), who is now a foul-mouthed bar owner, and the second is Richard Mueller aka 'The Mauler' (Laurence Fishburne) who, despite his rough past, is now a reverend serving the Lord. Doc asks these two old friends, who he hasn't seen in a couple of decades, to go with him to his son's funeral, which is scheduled to take place at Arlington National Cemetery. When Doc learns the details of his son's death, he has second thoughts about his son's potential burial site. 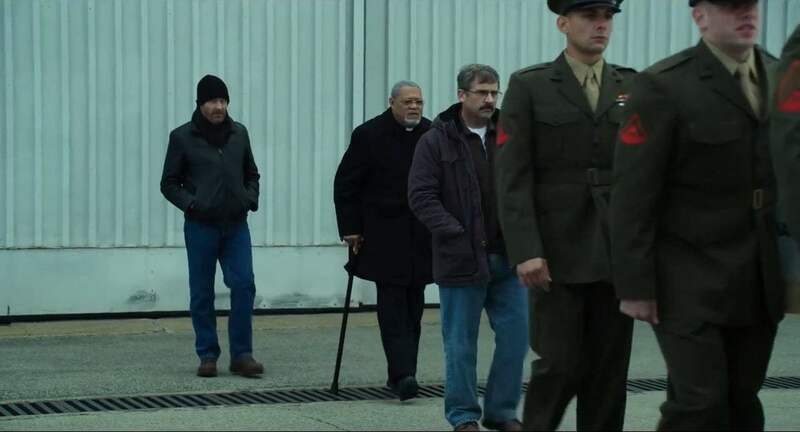 "Last Flag Flying" is the type of film we expect from Richard Linklater. It involves ordinary everyday people doing everyday things while having introspective conversations about life and the state of the world around them. 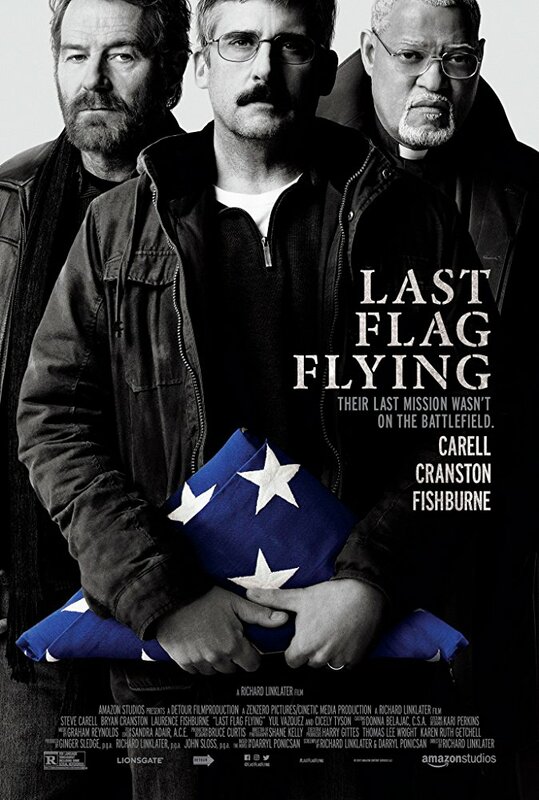 This film focuses on the current war in Iraq and former veterans who question the purpose of it. They often equate its futility with the war in Vietnam and lament on the fact that the American people were lied to once again, a lie that caused people's children to die because of it. Doc has to come to terms with the anger he feels towards the government that has lied, as well as his frustration towards the military that represents said government, which his son was so proud to be a part of during his service. That being said, the dialogue is not quite as gripping as we have seen from past Linklater films. The acting more than makes up for most of the time. Steve Carrell, Bryan Cranston, and Laurence Fishburne give fantastic performances and present the limited dialogue in a gripping, often painstaking manner. 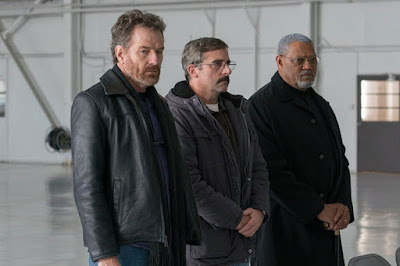 Unfortunately, the pacing of "Last Flag Flying" feels super slow and starts to drag in the middle of its runtime. It doesn't really get to its ultimate point quick enough for us to have kept the same level of interest as we did when the film started. Despite its tremendous performances, ones that didn't get enough attention during Oscar season last year, "Last Flag Flying" is just another road trip movie with a little more introspection. It isn't so much about the destination but the journey these characters go on to resolve their tired souls, anguished hearts, and weary minds. Still, this journey isn't as engaging as it could have been. We wound up enjoying this for the most part but still longed for a bit more from it. We didn't quite get the emotional punch we were looking for from such a hefty subject matter like this one.